I’m such a sucker for these things. I’m the star. Ha. who knew? That you are the High Priestess is beyond obvious, but that’s what they called me too – and that can’t be right. High Preistess, huh? I should’ve guessed that. That’s a very auspicious card. I’m the Hermit. No matter how I slice and dice it, no matter how many of these tests I take, it’s always the same. The Wheel is a lot of fun, Josh. Yer a pot-stirrer – I know your brother is! Ahh… Alisa, you’re the Star (cue the Enya music). :-) No wonder you’re attracted to Bridal – you inspire calm where there is chaos. I took it twice, some answers should have more than option. I have multiple interests/ moods/ personalities (?!). I got the Strength card. What do I make of this dual reading?! Kathleen, could it have been more on point for you? hmmmm, mine is pretty optimistic for how stressed I’ve been lately. I may need to blow this up and put it on the mirror..
I’M THE DEVIL!! I didn’t see that one coming, oh well. I guess now I have permission to rule the world. This was one of my favorite quizzes. 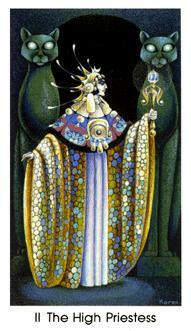 I’m the High Priestess, also (and I like it! ).